Today I ran the farthest I have ever run. 16 miles in 2:35. Coming off a month of fabulous long runs in amazing weather conditions, I was super excited about my run this morning. Unfortunately, I got a little cocky with the weather and wore shorts - a decision that haunted me for most of those 16 miles. It wasn't that I was "cold", my muscles just couldn't let go. In particular my quads and my glutes were tight and my legs felt heavy the entire run. My lulu crops would have been a much better choice. With that being said, the weather today was AMAZING! 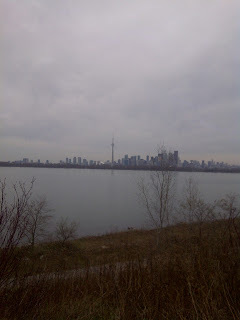 I've been sticking to the Martin Goodman trail / Leslie spit this month just adding on each week. I like running the same route - mentally it helps me visualize where I am and what I've got to do. 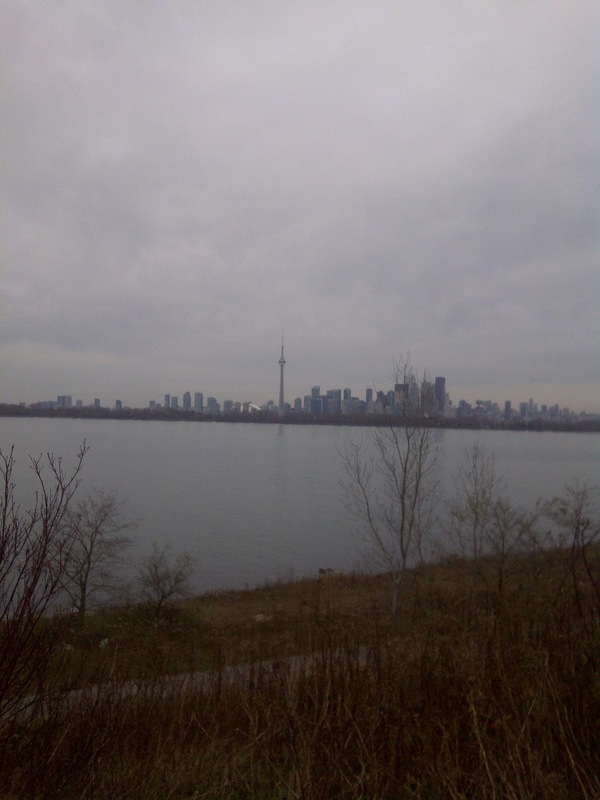 Today I ran out Lakeshore to Cherry, down to Cherry Beach, across the trial to Unwin, east to Leslie, down the spit, east path, to the lighthouse, UP the hill to the lighthouse, then back along the western loop to home. 16.3 miles to be exact - that's 26.2km - that's over 60% of a marathon! As I got to the bottom of the lighthouse hill, my trusty GPS told me I was at 10 miles. I felt pretty good, has surrendered to the cold hard muscles in my legs and I charged up the hill. My no means is this hill long, nor very steep but today was the first time I climbed it. At the top I stopped to have a hammer gel. snapped a photo, drank some water and said - hey - ONLY 6 MILES to go! And down I went and ran the 6 miles home. I'm still amazed it is the last weekend of November! Next weekend is the Tannenbaum 10k so I won't be getting a real long run in but I'm sort of looking at this like a little recovery week. Then 2 more long runs before I get a reprieve from the cold and have 2 full weeks of warm weather running in Florida. I know I'm going to be ready for the Ft. Lauderdale A1A Marathon in February ! I've been slowing talking more and more about the spring and the 2012 season, what I need to do and how I need to get there. My Half-iron race is either Welland (Multi-sport Canada ) or Syracuse Ironman 70.3. There are pros and cons for each race - big vs. small, 1 hr away vs. 4 hr away, flat course vs. hilly course, and of course COST. In any event, guidance on this decision would be nice so Barry and I need to talk about it. Oh, both races are on June 24! In getting ready for Ironman training I'm about to purchase my trainer (cyclops fluid pro) and get my bike fitted with aerobars. I've been talking about getting a coach or joining a club ... trying to figure out what's best for me and if perhaps I would be the best coach for myself .... I hope to find clarity on this issue in the New Year!